Who doesn't love food buffets? Buffets offer wide spread of delicious food, catering different taste buds. From Meat Eaters, Vegetarians, Dessert monsters and a wide array of different regional and international cuisine, dishes that your tummy can't get enough. Vikings Luxury Buffet is one of the fore runners in the luxury buffet scene in the Metro. Vikings currently have 5 branches: the newest one in Megamall, Lanang Premier in Davao, North Edsa, Marikina and Mall of Asia. 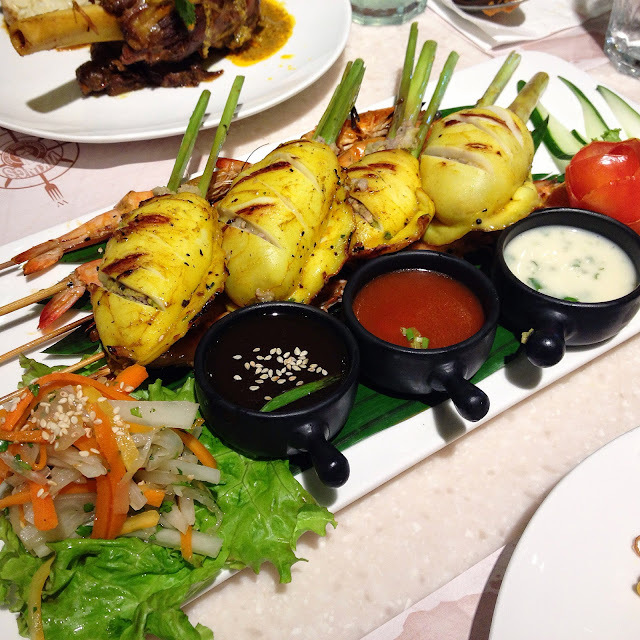 For the whole month of August, Vikings included new South East Asian dishes in their buffet spread. Each branch has their own unique take on our favorite South East Asian dishes that you'll never find in other branches. 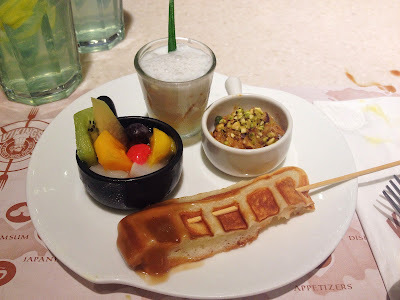 I was lucky to be invited to try the new South East Asian dishes at Vikings Mall of Asia. Here's a quick peek of the dishes we had. New addition to their soup selection is this Asian soup made of Laksa Shrimps, Vermicilli and Bean Sprout. I'm not a fan of the traditional Laksa. Some may say that the Laksa has a subdued taste, but for me, it was just right. The spices was not prominent, the milky texture was more prominent. 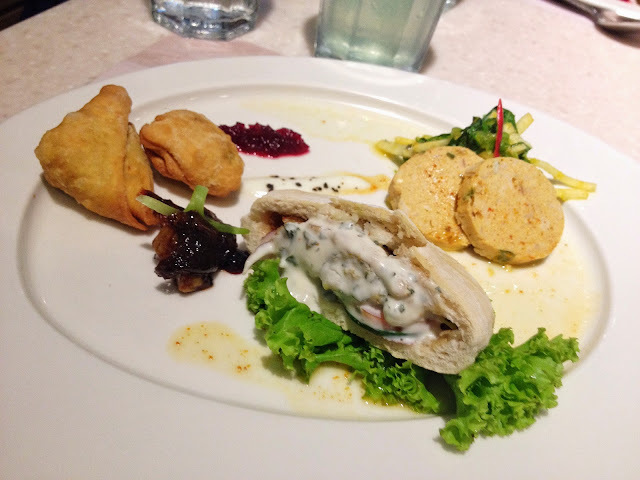 This is an assortment of Indian Appetizer. 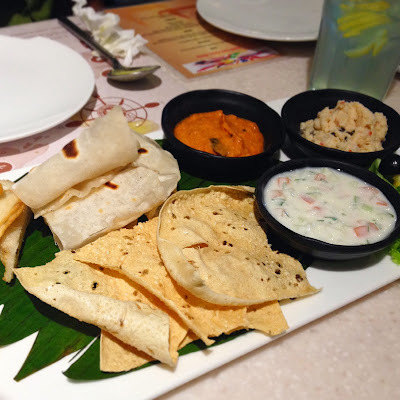 If my memory serves right, it consists of an assortment of flatbreads: Roti, Chapati and Papadum with a side of Indian Chutney dips: Tomato Chutney, Yogurt Chutney and the other chutney that I wasn't able to try. Another Indian Appetizer platter which consists of Samosas, Falafel in Pita and Tandoori Chicken Terrine with Jicama, Mango and Coriander Salad with Lemon Vinaigrette. I loved this platter. I couldn't get enough of the samosas, which tasted like our empanadas, savory and yummy. The salad was a fresh welcome to my taste buds. I loved this Mee Goreng to bits, despite the dominant flavor of spices mingling on my tastebuds. Lamb Shank Rendang with Hainanese Chicken Rice and Potato Bhajis with a side of Cucumber, Pepper and Pomelo relish. This dish was the highlight of all the dishes. The lamb was so good, I didn't mind the impactful taste of Rendang. While the roof of my mouth was already burning from the spices, I was still chomping on the lamb. The Hainanese Chicken Rice paled beside the Lamb Rendang, though it was a warm break from the spices. The chicken was moist, and the Potato Bhajis was a surprise, hidden in the chicken rice. With Lamb Rendang chomping activity, I just took a few bites on this dish. The squid and shrimp was okay, I wished that the shrimps could have been a bit bigger. This is a sampler of South East Asian Sweets. A quaint bowl of fresh fruits and almond jelly, pearls in coconut milk like a ginataan, and the nutty sweet dessert that I forgot its name. This is Singapore's version of Halo Halo. The Ice Kachang was not too sweet like our own halo halo. It has the same ingredients like mongo beans, red and green jelly, nata de coco, corn and a scoop of vanilla ice cream. For foodie fans of Indian, Malaysian, Indonesian and Singaporean dishes, the new dishes are not what you can expect. The flavors of spices were indistinct, which I think is perfect for the Filipino palate. I think Filipino buffet goers would enjoy the new South East Asian dishes. Thank you Vikings for inviting me to taste these new dishes. Disclaimer: Personally, I'm not a fan of Indian nor Malaysian cuisine. I like spicy food, it's just that the overwhelming combination of spices were a bit too much for my taste buds. But I'm not afraid to try a bite or two of their dishes. I can't wait to eat like a Viking on my birthday on September! Which one of these dishes would you try?